This artist's depiction shows Sierra Nevada's Dream Chaser spacecraft in orbit. The shuttle-like spacecraft could land at a regular airport, according to officials with the company. A privately built spacecraft shaped like a space shuttle could land at a conventional airport, said its builder, the Sierra Nevada Corporation. The Dream Chaser spacecraft — which is expected to continue flight tests later this year — would use Ellington Airport's Spaceport in Houston as a landing site for at least the uncrewed version of the craft. The agreement is subject to Ellington receiving approval for use as a spaceport, officials added. "Entering into this new agreement with HAS [Houston Airport System] will lead to enabling all variants of the Dream Chaser spacecraft to land in Houston, offering the ability to return cargo and science to Houston directly from space," Mark Sirangelo, corporate vice president of Sierra Nevada Corporation's space systems, said in a statement. Sierra Nevada has been seriously contemplating using airports for Dream Chaser's landings since at least November, when it presented a study on the topic at the Space Traffic Management Conference at the Embry-Riddle Aeronautical University. This artist's illustration shows the Dream Chaser landing on Ellington Field in Texas. At the time, Sierra Nevada said it was reviewing "the applicable standards and unique requirements that must be addressed" before such a landing could take place. It's possible to place the spacecraft in an airport environment, because it doesn't require any unique navigation or landing aids and its propellants aren't toxic, Sierra Nevada said at the time. 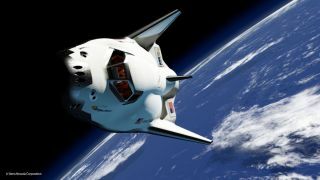 Dream Chaser was originally intended to ferry astronauts to and from the International Space Station, and the company received millions of dollars from NASA in competitive commercial crew agreements to fund the development. But in 2014, NASA chose not to include Sierra Nevada in the last round of development funds. The space agency instead opted to continue funding plans from SpaceX and Boeing to bring astronauts to the station. Sierra Nevada then launched a government complaint alleging favoritism in the process. The Government Accountability Office turned down the protest in January, saying "the proposals submitted by Boeing and SpaceX represented the best value to the government." So far, Dream Chaser has undergone several "captive carry" tests under an aircraft and a single glide test in 2013, when the prototype skidded off the runway due to a gear problem. The company plans to re-pitch Dream Chaser to NASA as a robotic spacecraft that could deliver cargo to the space station, and is expected to perform another glide test later in 2015, according to a recent Space News report.